The most common way to get funding for an international development / aid project is by writing a proposal and submitting it to a donor (or many donors!). Donors read hundreds, if not thousands, of proposals each year. Well-written proposals are more likely to get their attention and ultimately to be funded. Many donors require you to submit your proposal using their specific format. However, in cases where the format isn’t specified this simple proposal template may be helpful for small to medium size programs. The donor doesn’t have a specific proposal template. The proposal is for a small to medium size program. The donor has a specific proposal template that you should use. The proposal is for a large or complex program. 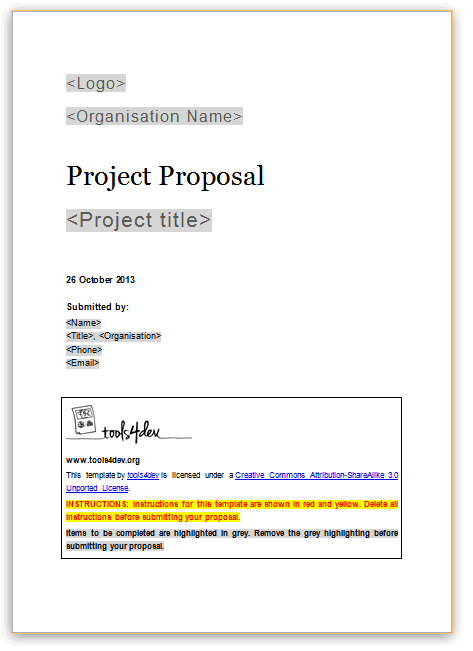 The Proposal Template by tools4dev is licensed under a Creative Commons Attribution-ShareAlike 3.0 Unported License. All other content is © tools4dev.